This 3 night, 4 game package allows golfers to experience some quality country clubs full of character, serenity and unique challenges, with each course providing varying challenges. 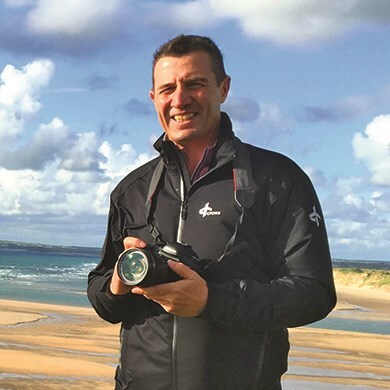 If you are keen to add some hot air ballooning, hiking/biking or sampling the region’s bountiful array of world-class food and wine, then we can certainly add this to your package. 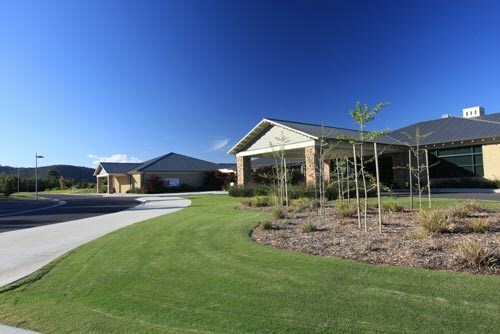 The Gardiners Run Golf Course is a brand new facility offering purpose built practise facilities and a golf course that has been described as a member friendly course offering a little something for golfers of all ability. The Club also boasts a fully equipped golf shop, bar and catering facilities and one of the best clubhouse views overlooking the 18th green. 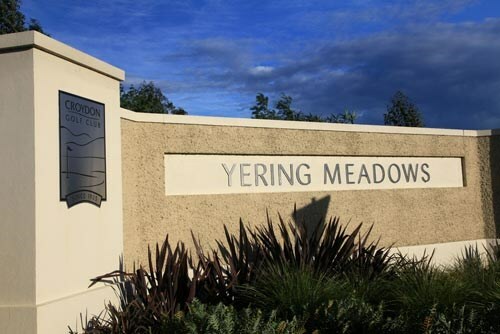 Yering Gorge Cottages has eight free-standing, one bedroom cottages ideal for couples or families with younger children. Our one-bedroom cottages contain large corner spa baths, floor to ceiling panoramic windows overlooking the Yarra Valley, Christmas Hills and The Eastern Golf Club. Each cottage features a large private deck with barbeque, kitchenette and wood fireplace. 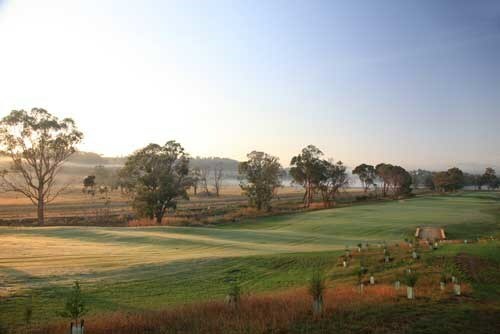 The course is a well maintained and challenging 18 hole par 71 set amongst long established native trees, and with an abundance of bird life adding to its charm and character the course provides an excellent and enjoyable test for all golfers. This charm and character is reflected in the Clubhouse where over 110 years of history complements the hospitality for which the Club is renowned. 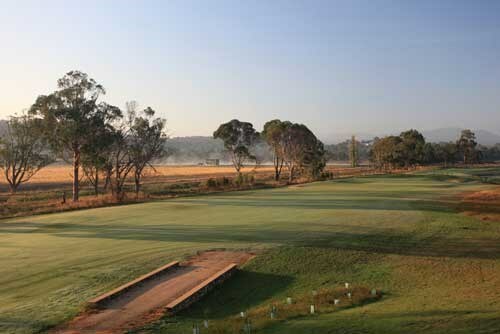 The Croydon Golf Club was established in 1925 at its former Dorset Road site and over the years has earned the reputation of being the premier golf club in the eastern suburbs. 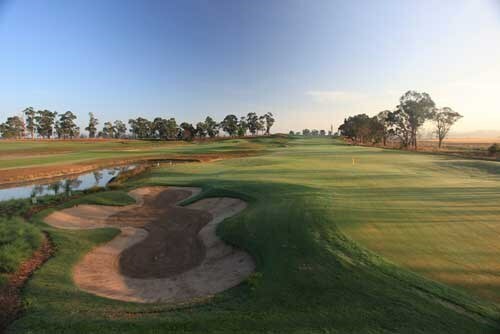 The club's relocation in June 2008 to its site in Yering is now complete with the full 27 hole Ross Watson designed course and 15 hectare walnut grove which opened in early 2009. 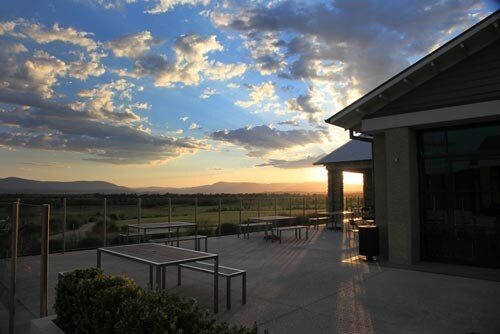 A modern clubhouse is nestled in amongst the property with commanding and uninterrupted views of the Yarra Valley. Renowned as a very friendly club the clubhouse facilities provide the ideal surroundings for the relaxation and enjoyment of members and their guests. 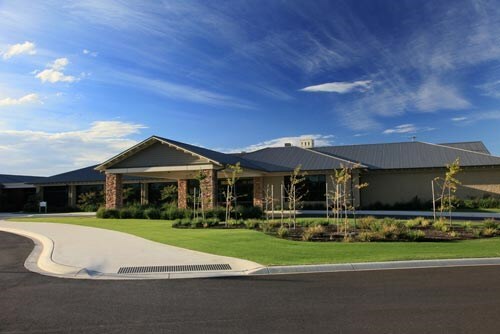 In May 2014 the golfing arm of the Chirnside Park Country Club was relocated from its Kingswood Drive location to its new site on Victoria Road in Lilydale. 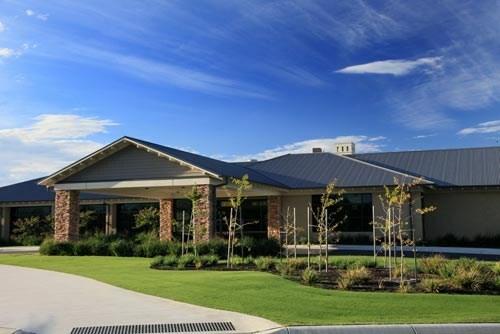 The Chirnside Park Country Club was established in 1974 and is located at the gateway to the picturesque Yarra Valley some 35 minutes from Melbourne. 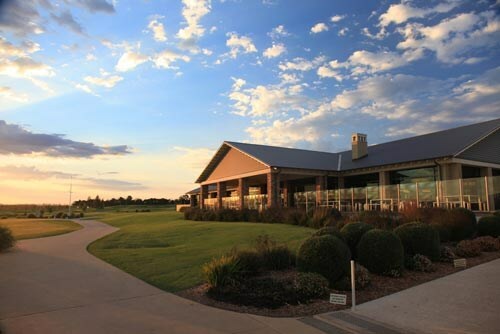 Although the course itself has relocated to the new Gardiners Run site the Country Club still operates a function & conference centre, gaming lounge, licensed bistro and a bowling & tennis facility. 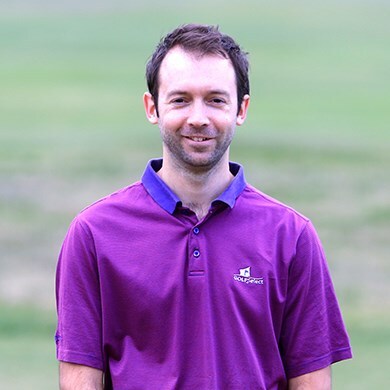 The Gardiners Run Golf Course is a great facility offering purpose built practice facilities and a golf course that has been described as a member friendly course offering a little something for golfers of all ability. The clubhouse also boasts a fully equipped golf shop, bar and catering facilities and one of the best views overlooking the 18th green. 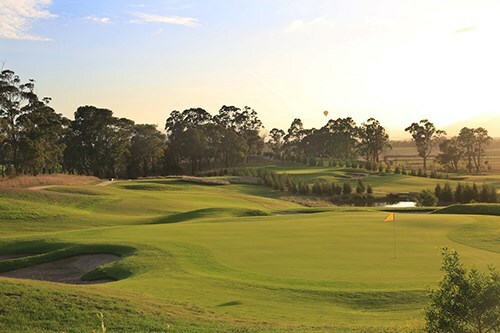 Gardiners Run Golf Course was named after John Gardiner who was born in Dublin in 1798 and came to Australia and took out one of the first grazing licenses in Melbourne. 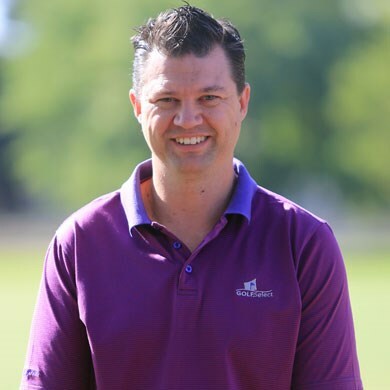 From there he set up an outstation which was called ‘Kangaroo Park’ which was located on the Yarra River not far from the existing Lilydale Airport. Later Mr Gardiner would build a homestead in Chirnside Park. A Squatters Directory listing in 1849 had a list of occupants on crown land in the district of Port Phillip with one named ‘Gardiners Run’. We feel this is a fitting tribute to an early pioneer of the area. Gardiners Run commences with an interesting par 4 with bunkers on the inside of the dogleg that look to offer a risk / reward temptation, however the smart play is to play straight down the middle and be left with a mid-iron to a large flattish green. This par 5 offers one of those special golfer moments as one crosses the ridge and sees the valley, 2nd green and holes 3 to 7 below them. Best played with a tee shot along the right hand side, which will use the natural contours to kick it back into the middle, the hole then entices golfers to go for the green. Certain to be one of the courses most photographed holes this short par 3 plays over water and sand to a gently undulating green. There is room to the front right and short for the not so brave but what the heck have a go and have some fun. This long par 4 plays uphill to a green surface that remains hidden for most of the journey. From the tee golfers need to be careful of the bunkers on each side of the fairway, then it?s a matter of club selection to find the centre of this large flattish green. Also beware of bunkers short and left of the green. The 5th at Gardiners Run is a hole full of options and temptations. Playing downhill and at less than 300 yards in a straight line going for the green is possible, however both sand or water will catch the errant shot. Laying up sounds safe but a fairway bunker short of the green puts a premium on tee shot position. 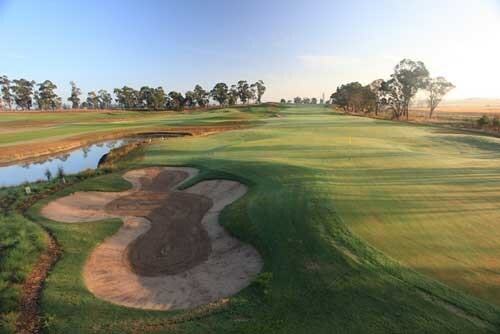 Holes with such a variety of strategic options are the essence of fun and tantalising golf. With water down both sides of the fairway and in front of the tee this is one of the courses more testing tee shots. However the intimidation is more in the mind than reality as a generous fairway lies ahead. The 2nd shot is an interesting mid /short iron approach to a green set above ones eye line and protected by bunkers across its front. Playing uphill this hole plays at least 1 club longer than you?d expect, and the bunkers and hollows that surround the green need to be avoided. The green also has a subtle ridge running across it ensuring this a more difficult hole than it first appears. 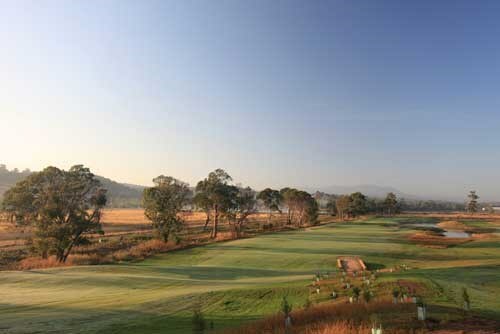 Playing downhill, this exciting par 5 offer beautiful views of the Yarra valley and beyond. A long straight tee shot sets up a 2nd shot and a reachable putting surface. For shorter hitters approaching from the left side of the hole will open up the well bunkered green. This moderately long par 4 returns golfers back to the club zone. Playing slightly downhill this hole is best played along the longer but un-bunkered left hand side. The green is slightly stepped with a ridge running across its middle. 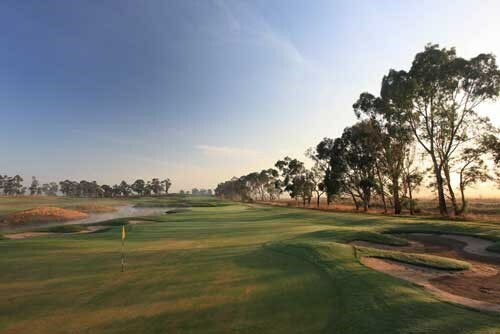 Being the most undulating hole, this par 5 is a reminder of the old Chirnside Park Golf Course with its uphill tee shot, the downhill approach to the green. Bunkers on the ridge provide direction for the tee shot with the safe play being to their left. From this ridge the rest of the hole is clearly visible and although playing shorter along the right side, the best approach angles are from the left side of the fairway. A difficult par 3 that has the greens? front and right side completely protected by sand, for the shy there is a bit of a bail out area to the left. The green also slopes steeply from back to front so staying below the hole is a sound play. 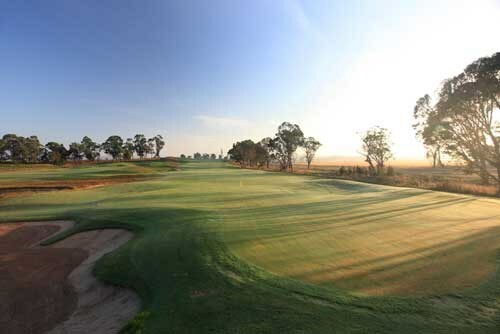 This undulating par 4 is best played from the centre of the fairway, bunkers to the left will catch an errant drive. The front of the green is quite open and can be approached with either a high or low approach shot. 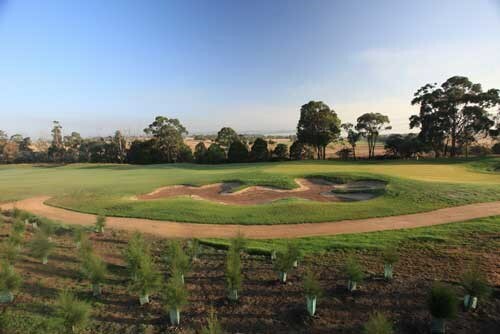 A most picturesque hole that has the backdrop of the Dandenong Ranges, this par 4 bends slightly to the right and with a fairway bunker on the outside of the corner golfers are tempted to hug the right side of the hole. However the angle of the green and location of greenside bunkers makes approaching the green from the left side a much easier alternative. A beautiful hole with a well-structured green. Bending to the left off the tee, bunkers on the inside of the dogleg can be challenged and if the tee shot gets past these the golfers can be rewarded with a few more yards from the downhill bounce and a great angle to attack the flag. A green with a few subtle slopes that is certain to test ones putting skills. A partially blind tee shot challenges golfers on this shortish par 4. A bunker on the ridge must be avoided and the best play is along the right half of the fairway. The approach to the green is from an elevated ridge and should only require a short / medium iron, this shot must avoid the deep bunker to the right of the green. The last of the par 3?s is a shortish hole that features a distinct change in levels. A huge bunker runs along the right of the green, while a small bunker will catch anything long and left. Careful club selection is required to make certain you end up putting on the correct level. This par 5 slides to the right off the tee requiring either a fade (left to right) shaped tee shot or a bold line along the right hand edge to the partially hidden fairway. From the landing zone the green is best attacked from the left side of the hole and long 2nd shots can use the slope and get very close to the green. A difficult par 4 that plays over a ridge then down to the green, that is partially surrounded by water and sand. The longer the tee shot the better and those who elect to drive over the left half of the fairway can catch a steep down slope that can kick your ball back into the middle of the fairway. The approach to the green is there to tempt the fools and test the brave, but it is the wise golfer who plays for the middle of the green. This long par 4 hole requires an accurate drive to the right side of the fairway for two reasons: the ball will tend to roll left with the slope after landing and you need to be as far right as possible for the best line to the green. Tee shots that finish on the left hand side leave you with trees blocking your shot to the green. Try to leave your ball below the flag and note that the green slopes right to left and from the back to the front. If the greens are running fast, a putt from above the roll can be exciting! Long hitters will be able to drive this short uphill par 4, but they will need to avoid the long rough that cuts in around the front of the green, avoid the bunkers and not lose the ball right and out-of-bounds. Others can choose to hit a club that leaves them with their preferred shot to get the ball close to the flag on a large green that mostly rolls from right to left. Anything too close to the left edge of the green can roll off. The green is deceptively long and it is easy to leave a pitch short of the flag. A straightforward downhill par 3 where what you see is what you get. Bunkers guard the front and sides of the green, so you should figure on carrying your tee shot all the way to the putting surface. The green slopes a little from back to front and left to right. A ball that lands on the right hand side can run off the green, but its a very simple chip back. There is a slight dogleg to the left on this hole. If you can hit your drive to the top of the hill or further, then it becomes a much easier proposition. But hit to the right hand side of the fairway. Otherwise your ball may roll left across the fairway and leave your shot to the green blocked by trees. The green slopes to the front and the left hand side. If you miss the green to the right and have to play over or out of the bunker, then you may find it difficult to stop the ball near the hole or even on the green. This hole calls for a careful decision on what club to hit from the tee. Apart from avoiding the out-of-bounds area that runs along the right hand side, take careful note of the distance and line to avoid the water hazard that sits forward and left of the green. If you have played to the flat section of the fairway right of the water, then you have an easy wedge to the green. But the green is distinctly two-tiered and slopes to the front. As always on this course, try to leave your ball below the hole. Another hole with out-of-bounds on the right. The fairway slopes right to left so the ball will probably run towards the trees on the left where you can get blocked out. So hit for the right hand side of the fairway. Long hitters can drive close to the bunkers, but you may want to leave yourself a full wedge out so that you can stop the ball on the elevated green. It slopes a little right to left and towards the front. A hole that provides choice for long and short hitters. Reachable, but not visible from the tee, the green is protected by water and trees if you want to hit it in one (ensure it is clear). Most players hit to the end of the fairway or at least past the pines and then play a short iron to the green. It can be a difficult shot, often from a dowhill lie to an elevated green with lots of slope to the front and the right hand side. Stay below the hole. Use the mirrors to check that the fairway is clear for a blind drive. This hole is a dog leg right so aim well left and try to keep it just inside the tree line. Longer hitters can make the green in two. Otherwise place your second so that you can play the next shot with a club that you can stop quickly on the green - depending on the pin placement it may be difficult to run the ball on. The green slopes to the front and to the right and can make a shot over or out of the left bunker difficult to stop quickly. There is a steep bank behind the green so dont miss long. A fun and challenging hole to finish the front nine. This one is much more difficult from the back tee for the average player who may struggle to get the distance while hitting the ball high enough to stop it on the putting surface. If you are going to miss, make it pin high left or close to the green front left and give yourself a good chance of par with an accurate chip. The green is relatively flat. This hole will reward you if you hit straight. Accuracy off this tee is important because missing right or left is likely to cost you a shot. Fade it up the middle or hit high over the tree on the right - if you want to get to the middle of the fairway which will run your ball to the left. That tree is probably the most battered on the course. The green is large and long. It generally slopes to the front and left although the right hand side is deceptively flat. Similar to the last hole with the fairway slope reversed. This medium length par 4 hole requires a careful tee shot into the left half of the fairway as the ball will probably roll to the right off the slope. The second shot will almost inevitably be with the ball below your feet if you are a right hander, so be wary of fading the ball into the bunker on the right of the green. Ensure that your shot to the green carries the bunker at the front and left. However, players should avoid hitting to the back or left of the flag as this will probably leave them with a difficult quick putt down the slope of the green. Check that the fairway is clear as you walk across from the 11th green. A long tee shot just inside the right tree line will get you to the bottom of the hill with a good line to the green. Less powerful hitters should hit the ball low and get it to run. If you dont make the gully, you will face a tricky downhill shot. Long hitters can get to the green in two, but others should keep the ball on the right side of the fairway for the best shot to the elevated green which is deceptively long and make sure you get your ball all the way back to the flag, but a steep slope from back to front means it is best to keep it below the hole. Best tip on this hole is dont miss the green which is large and slopes steeply on the left half before flattening out. It also slopes from back to front. If you insist on missing the green, do it to the right as a flop or bunker shot from the left can be impossible to stop on the left half of the green. The tee is often sheltered from winds that catch the ball as it nears the green so pay attention to the prevailing conditions. A hole on which it is helpful to be able to hit the ball left to right. This means your tee shot plays back into the slope - you want to keep it away from trees and out of the rough that cuts in on the left hand side. The green can be reached in two shots. Try to avoid the rough that cuts in on the front right of the green and also avoid the bunker on the left. Only if you miss the green badly left or right will you face real problems. The green is large and slopes from the right. A short par four that can be surprisingly challenging because of the difficulty of getting your second shot near the flag. The green has some swales at the front and slopes towards the back. The front is protected by bunkers that allow only a narrow opening onto the green. Best to leave your tee shot so that you can follow up with a wedge that you can fly to the flag with lots of backspin. Or drive into a bunker right or left and rely on your sand skills for a chance at birdie. A slight dogleg right with a downhill drive offers a chance for a good score on this hole. Drive down the left half of the fairway and of course beware of the trees right and left for the first part of the journey. The fairway will probably run your ball left to right. Out of bounds on the right hand side and the possibility of being blocked out from the green so miss left if you must. The green slopes left to right but presents a very fair target for a short second shot. A smallish green sloping from left to right. Stop your ball anywhere on the green and putt for birdie. Simple. If the fairways are hard, then a tee shot landing on the rise is going to run hard right and may leave you blocked out by the trees that cut in from the right hand side. So decide whether you prefer to chance your luck with a very accurate long drive just inside the trees on the left or lay up on the start of the rise for a longer direct shot to the green. Bunkers guard the front left and the right - hitting into them isn't a bad option if in trouble off the fairway. The green is large and slopes steeply to the front right. It can make downhill putting a very nervous exercise. 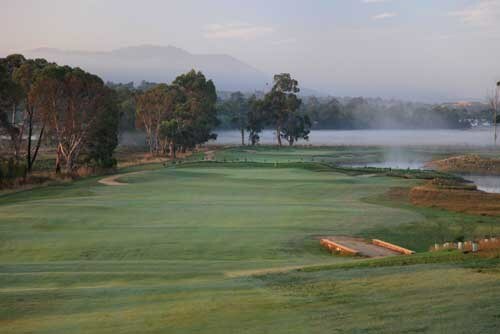 The Croydon Golf Club was established in 1925 at its former Dorset Road site and over the years has earned the reputation of being the premier golf club in the eastern suburbs. 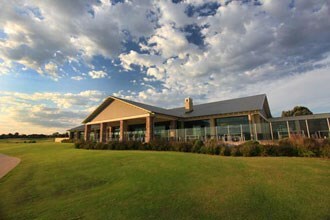 The club's relocation in June 2008 to its site in Yering is now complete with the full 27 hole Ross Watson designed course and 15 hectare walnut grove which opened in early 2009. 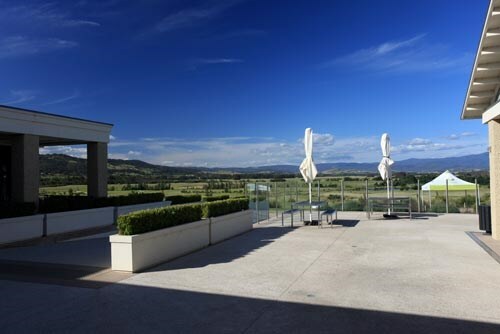 A modern clubhouse is nestled in amongst the property with commanding and uninterrupted views of the Yarra Valley. Renowned as a very friendly club the clubhouse facilities provide the ideal surroundings for the relaxation and enjoyment of members and their guests. All players are expected to meet the Clubs dress expectations. Full details of dress expectations can be found here. Elevated tees provide an inviting opening hole. With a hazard right and bunker left a well positioned tee shot allows an easier approach to a small two-tier green. Fairway bunkers guard left side of this fairway. A precise approach from the fairway is a necessity to this elevated green. Advanced golfers may attack but safety is to the front left portion of the green. Accuracy and the correct club selection makes this a strong par three. With a large putting surface a generous run-up to the middle/left of this green provides some relief from the right hazard and bunkers that surround. A deceptive hole with course knowledge making this a real birdie chance. Position safe to the left of the large fairway bunker or longer hitter straight over at the green. The small fast sloping green is tilted from left to right. The first of the great par 5's on this course. All emphasis is placed on hitting this fairway. With a hazard left and a bunker right, place your drive in the fairway and second shot within short iron distance to the green. Club selection needs to be precise with approach to this deep green. A long par four with plenty of options. Drive short of the bunker in the middle of the fairway or take it on. Right side of this fairway provides the biggest advantage. Shorter hitters watch your second shot as water weaves in front of the green. Simple in theory but though to execute! This short par 3 sets a tricky challenge for all level of golfers. Favour the front of this green with a sever drop off long. The hole that all golfers talk about. Hit tee shot straight at the three bunkers in the distance, longer hitters just left. Work out how far you want for your third or become a hero and fire your second at the green. There is more room left of this green than it looks. A strong hole with a par being a good score. Tee shot to the right side of the fairway will leave a long up hill shot to a deep two-tier puttiong surface. Avoid the two bunkers right of this green and two putts to finish this hole is a good result. Precision is a necessity on this visually spectacular par 5. A tough driving and lay-up hole with a hazard down the right side. Room right of this green provides some relief and a definite birdie chance if you stay dry! This hole will test all level of golfers. The longer you hit, the tighter this fairway becomes. A tough second to this small sloping left to right green makes for a great risk reward hole. With a green surrounded by bunkers a high flighted shot is required. The subtle tier in this green provides a great putting surface for making a birdie or saving your par. You will be tested from this point in so enjoy this short hole. The longest of the par 5's starts with pleasure and ends with torment. Many options are presented with your lay-up and approach to this hole guarded by hazards. Take note of water yardage carries and bunker placements to navigate your way down this hole. Visually a very tough short par 4. This fairway is wide before the first of the right side bunkers. Longer hitters have a narrowing landing area. Play it safe or take this hole on and be rewarded. Precision down this entire hole is a must. A tempting hole for the longer hitters. Take the driver and fire straight at the green but that's where the danger is. This semi island green is guarded by water. With many options it's short but suits the disciplined player. Normally playing towards a northerly wind this par 3 can play long with a water carry required to get on the left side of this green. The centre of this green feeds left helping to soften this hole. Lots of room short right provides some relief. With no water guarding either side of this fairway the only question needed answering is what line to take with longer hitters over the right side bunker. This deep green requires precision to provide a short birdie chance. A tough par 4 requiring distance and accuracy. Avoidboth hazard and bunkers with your tee shot and face mid-long iron up the hill. This two tier green has a false front right edge but is also a good area leaving a simple approach. This mid length par 4 is best attacked with precision. A long iron or fairway wood to the left side of this fairway is best suited. A large putting surface awaits with bunkers guarding the front right of this green. An elevated green with bunkers and collection areas make this a tough target to hit. Best approach with a short iron or pitch shot. Avoid the scattered fairway bunkers off the tee and a birdie is a real chance. With stunning views this down hill par 4 provides a stern test. Drive long and straight towards the right side bunker, this fairway will feed your ball left. The left greenside bunker and collection area in front of this green make for a deceptive approach. All that can be seen is bunkers on this, the shortest of the par 3's. This green is rather undulating from back to front. A fantastic short par 3. An elevated first half of this hole feeds down to a well guarded lay-up and approach area. Tee shot should be directed towards the right side of the fairway with a sever drop off left. Attack with caution and be rewarded. With a hazard right and bunkers left a well positioned tee shot is required to tackle the large putting surface with a short approach shot. This is an inviting birdie chance. Precision is needed with a well guarded green of bunkers, collection areas and a right side hazard. This two-tier green that slops towards the hazard provides some assistance in finding a right side pin position. With an index of number 1 on this golf course a tough test awaits. This fairway needs to be found with hazard left and bunkers right. Water feeds in front of this sloping back to front green. Par on this hole is a great result. This climbing par 5 is covered with scattered bunkers the entire way up the fairway. Avoid these and the best angle of approach is from the right to a fantastic small two tier green.